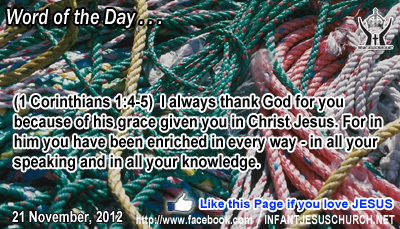 1 Corinthians 1:4-5: I always thank God for you because of his grace given you in Christ Jesus. For in him you have been enriched in every way - in all your speaking and in all your knowledge. Heavenly Father, give us the heart to see reasons to be grateful for all of your children. We confess that it is often so easy for us to analysis others based on how they analysis us, share our theological opinions, or how much trouble they cause us. Forgive us, for we know if you had done the same with us, we would have never been one of your children. Please help us rejoice in your children. In Infant Jesus' name we pray. Amen. 11 As they heard these things, he proceeded to tell a parable, because he was near to Jerusalem, and because they supposed that the kingdom of God was to appear immediately. 12 He said therefore, "A nobleman went into a far country to receive a kingdom and then return. 13 Calling ten of his servants, he gave them ten pounds, and said to them, `Trade with these till I come.' 14 But his citizens hated him and sent an embassy after him, saying, `We do not want this man to reign over us.' 15When he returned, having received the kingdom, he commanded these servants, to whom he had given the money, to be called to him, that he might know what they had gained by trading. 16The first came before him, saying, `Lord, your pound has made ten pounds more.' 17And he said to him, `Well done, good servant! Because you have been faithful in a very little, you shall have authority over ten cities.' 18And the second came, saying, `Lord, your pound has made five pounds.' 19And he said to him, `And you are to be over five cities.' 20Then another came, saying, `Lord, here is your pound, which I kept laid away in a napkin; 21for I was afraid of you, because you are a severe man; you take up what you did not lay down, and reap what you did not sow.' 22He said to him, `I will condemn you out of your own mouth, you wicked servant! You knew that I was a severe man, taking up what I did not lay down and reaping what I did not sow? 23Why then did you not put my money into the bank, and at my coming I should have collected it with interest?' 24 And he said to those who stood by, `Take the pound from him, and give it to him who has the ten pounds.' 25(And they said to him, `Lord, he has ten pounds!') 26`I tell you, that to every one who has will more be given; but from him who has not, even what he has will be taken away. 27But as for these enemies of mine, who did not want me to reign over them, bring them here and slay them before me.'" 28And when he had said this, he went on ahead, going up to Jerusalem. The Lord assigned us with his gifts and graces and he gives us freedom to use them as we think best. With every gift and talent, the Lord gives enough grace and strength for using them in a fitting way. As the parable of the talents shows, God detests indifference and an attitude that says it's not worth trying. God honors those who use their talents and gifts for doing good for others. Those who are sincere with even a little are entrusted with more. But those who ignore or neglect what God has entrusted to them will lose what they have. There is a significant lesson here for us. No one can stand silent for long in the Christian life. We either get added or we lose what we have. We either advance towards God or we fall back. Do we trust in God's grace to make good use of the gifts and talents he has given to us? Loving Infant Jesus, be the ruler of our heart and mind and the master of our home and goods and work place. Fill us with a generous and wise spirit that we may utilize the gifts, talents, time, and resources you give us for your glory and your kingdom.